What's one of the best ways to get attention from passersby, both in cars and on foot? 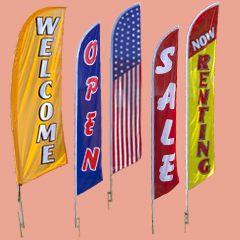 Using advertising flags and banners outside your store or business. 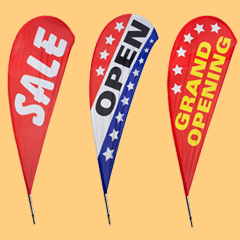 Outdoor flags fly with the natural motion of wind to wave and flutter about, creating a sure-fire method of attracting the eyes of potential customers. Advertising flags and banners, placed strategically on the grounds or sidewalk outside a store, enchant people so they will stop and take notice. To put it simply, they are clear and effective promotional tools that showcase a stock pre-printed message. 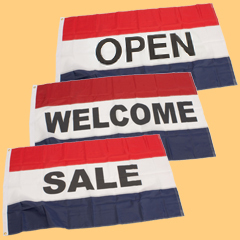 These advertising flags and banners announce that you are "OPEN" for business or highlight upcoming specials and events. These don't have to be used just by retailers. Restaurants utilize them to welcome patrons or to announce their grand opening. Our wholesale company, an industry leader, sells this sign supply in an easy to navigate online catalog. What types of promotional outdoor signs are featured in this category? Advertising flags and banners come with pre-printed messages that cater to the common retail industries. There are the standard 3' x 5' rectangular size, as well as the feather blade and teardrop shapes with various methods of display whether placed on a solid surface or staked into the ground. There are tall european-style pole flags in two heights, 17' and 13' foot that are designed for outdoor usage. These impressive visual signs, also called giant poles, can make quite the impact. This gives them the feature of becoming easily portable. 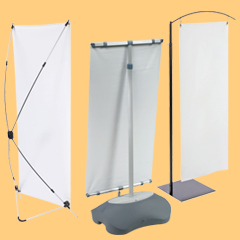 We also offer various types of banner stands for both indoor and outdoor use. These signs hold a wide variety of banner sizes with some being adjustable so you are able to easily fit a pre-existing banner on there. Most outdoor pennant stands come with a fillable base for added stability. Just fill with sand or water. There are also many different styles of flag and pennant supports. We have bases that feature an X-Frame support, some that hang the banner directly from the top, poless that are able to exhibit flags with grommets, classic wall-mounted flagpoles, and more options for you to look through as well. Most of these banner stands are also collapsible for easy portability. 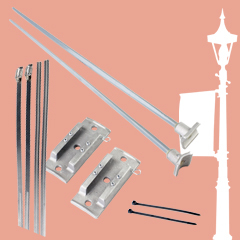 We have lamppost brackets as well, both single and double winged versions. A good deal of these pieces come with brackets that allow you to choose the length of the banner you want to display. We stock both upscale and economy versions of this sign hardware so there are lots of choices for our customers. Please keep in mind that none of the pennant or flag hardware listed above comes with custom printed artwork. It is just the hardware that is being sold. This is done so that you are able to create custom made banners exactly to your specifications. A custom pennant that noticeably lays out the details, especially if the banner is advertising an event or meeting, is far more effective at enticing and informing anyone who sees it. If you are looking for flag signs, we've got some of those available as well. These 5'w x 3'h easy setup flags feature three stripes in red, white, and blue. The middle white stripe carries one of four stock messages: "WELCOME", "OPEN", "SALE", and "PIZZA." These printed flags are designed for outdoor use and are tough enough to handle inclement weather conditions. By not having to have a flag custom printed up, you will be able to save money that could be used for your business. You will also be able to save time, as you can take the product right out of the box and set it up to start advertising for you and your establishment right away. These are easily seen as cars drive by at 50mph! If you have any similarly shaped flags that you already own, they will work well with the above flag poles as well. Change your display with the seasons or when a special event is happening to really grab the attention of the people coming by!